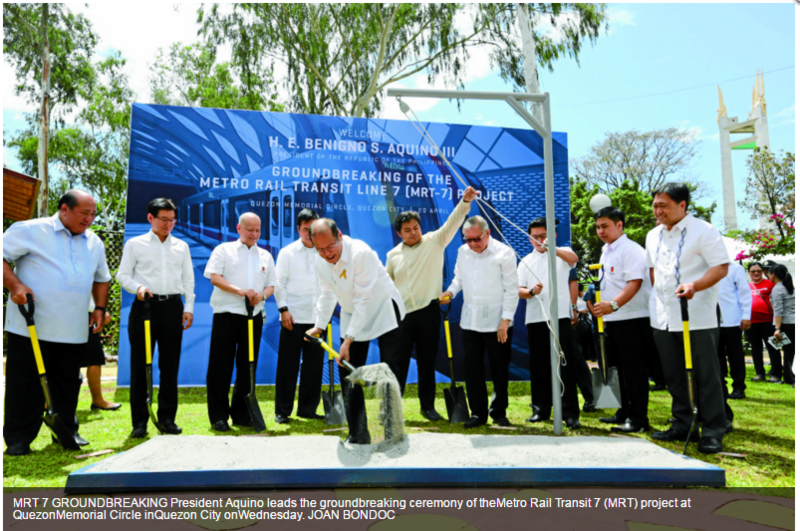 After a long delay, the P69.3-billion Metro Rail Transit Line 7 (MRT 7), which will connect Quezon City to Bulacan province, finally broke ground on Wednesday. “These kinds of projects are not like candies you can buy from sari-sari stores. This needed a thorough study to iron out the wrinkles so that there will be no inconvenience in the future,” President Aquino explained the delay during groundbreaking ceremonies at Quezon Memorial Circle. The MRT 7 contract signed in 2008 was delayed by the change of government leaders, financial requirements and a controversy over whether the common station should be built at SM North Edsa or at TriNoma, also on Edsa. Expected to be finished by 2020, the 22-kilometer elevated railway will have 14 stations from North Edsa (connected to MRT 3) to San Jose del Monte, Bulacan. By that time, Mr. Aquino said he would probably be enjoying retirement in Tarlac province. “As a private citizen, I will probably be driving along NLEx (North Luzon Expressway) to Bocaue Interchange and traverse the new 22-km highway to San Jose del Monte,” the President said. “I will park in the new Intermodal Transport Terminal and walk toward the new train system. On this commute, I will contemplate how far our country has come,” he said. The construction of the new highway from NLEx to San Jose del Monte and the intermodal terminal are part of the integrated transport project to be developed by SMC Mass Rail Transit 7 Inc., a subsidiary of San Miguel Corp. (SMC). SMC will be involved in the financing, design, construction, operation and maintenance of the project. The railway line was contracted to Hyundai Rotem and EEI consortium. “Mr. President, we are excited to finally get this project going. Good, reliable public transport systems are an essential part of development,” SMC president and chief operating officer Ramon Ang said in his speech. Ang said travel time from North Edsa to San Jose del Monte would be reduced to 30 minutes from the current two hours with the completion of MRT 7. MRT 7 is expected to have an initial daily capacity of 550,000 passengers. It will be able to carry 28,000 passengers per hour on each direction during peak hours. SMC Mass Rail Transit 7 aims to ultimately have 850,000 passengers daily. MRT 7 will have stations at Quezon-North Avenue, Quezon Memorial Circle, University Avenue, Tandang Sora, Don Antonio, Batasan, Manggahan, Doña Carmen, Regalado, Mindanao Avenue, Quirino, Sacred Heart, Tala and San Jose del Monte.